PARENTS PLEASE USE THE ABOVE MAP TO IDENTIFY THE SAFEST ROUTES FOR WALKING OR BIKING TO SCHOOL. THE RED DOTS SHOW WHICH SIDE OF THE STREET THE STUDENT SHOULD WALK ON WHEN THERE IS NOT A SIDEWALK AVAILABLE. 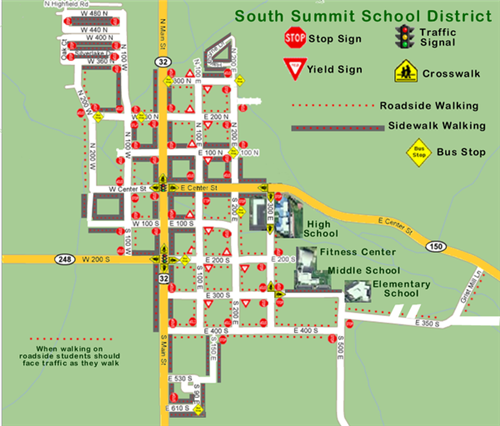 STUDENTS ON THE WEST SIDE OF KAMAS SHOULD ONLY CROSS MAIN STREET (U32) WHERE THERE IS A SIGNAL LIGHT (CENTER STREET AND 200 SOUTH). PLEASE REMEMBER THAT KINDERGARTEN STUDENTS ARE BUSSED TO SCHOOL EVEN IF THEY LIVE WITHIN A MILE OF THE ELEMENTARY SCHOOL. Parents may call the district office (783-4301) in cases of serious emergencies when a student or bus driver must be contacted while the bus is en route.